IC Types – An Integrated Circuits Fabrication Process consists of several interconnected transistors, resistors, etc., all contained in one small package with external connecting terminals. The circuit may be entirely self-contained, requiring only input and output connections and a supply voltage. Alternatively, a few external components may have to be connected to make the circuit operate. Integrated Circuits Fabrication Process may be classified in terms of their function as analog or digital. Analog ICs (also termed linear ICs) may be amplifiers, voltage regulators, etc. Digital ICs (logic gates and counting circuits) contain transistors which are normally either in a switched-off or switched-on state. The techniques used in manufacturing integrated circuits provide another method of classification. The major IC manufacturing technique is termed monolithic. Other fabrication techniques are thin-film, thick-film, and hybrid. In a monolithic Integrated Circuits Fabrication Process all components are fabricated by the diffusion process on a single chip of silicon. Interconnections between components are provided on the surface of the structure, and external connecting wires are taken out to terminals, as illustrated in Fig. 7-17. The vast majority of integrated circuits are monolithic because it is the most economical process for mass production. Thin-film integrated circuits are constructed by depositing films of conducting material on the surface of a glass or ceramic base. By controlling the width and thickness of the films, and by using different materials selected for their resistivity, resistors and conductors are fabricated. Capacitors are produced by sandwiching a film of insulating oxide between two conducting films. Inductors are made by depositing metal film in a spiral formation. Transistors and diodes are usually tiny discrete components connected into the circuit. Thick-film Integrated Circuits Fabrication Process are sometimes referred to as printed thin-film circuits. In this process, silk-screen printing techniques are employed to create the desired circuit pattern on a ceramic substrate. The inks used are pastes which have conductive, resistive, or dielectric properties. After printing, the circuits are high-temperature-fired in a furnace to fuse the films to the substrate. Thick-film passive components are fabricated in the same way as those in thin-film circuits. As with thin-film circuits, active components are added as separate devices. 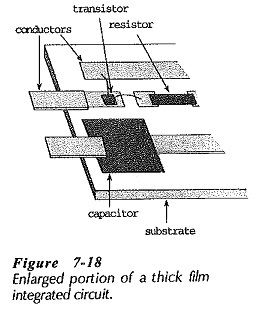 A portion of a thick-film circuit is shown in Fig. 7-18. 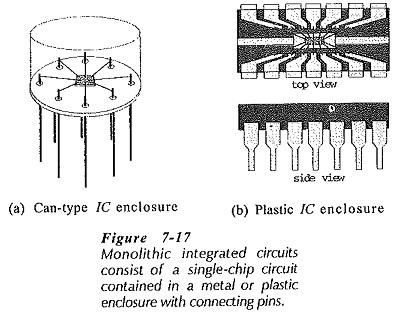 Integrated circuits produced by thin- or thick-film techniques usually have better component tolerances and give better high-frequency performance than monolithic integrated circuits. 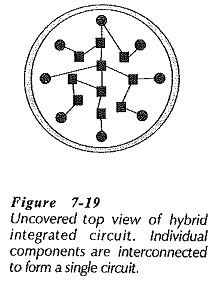 Figure 7-19 illustrates the structure of a hybrid or multichip integrated circuit. As the name implies, the circuit is constructed by interconnecting a number of individual chips. The active components are diffused transistors or diodes. The passive components may be groups of diffused resistors or capacitors on a single chip, or they may be thin-film components. Connections between chips are provided by fine wire or metal film. Like thin-film and thick-film ICs, multichip circuits usually have better performance than monolithic circuits. Although the process is too expensive for mass production, multichip techniques are quite economical for small quantities and are frequently used as prototypes for monolithic Integrated Circuits Fabrication Process.